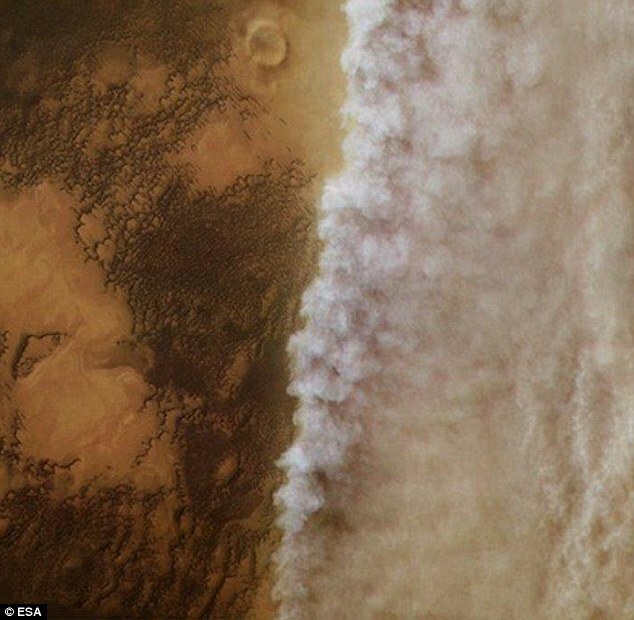 Staggering new Nasa footage has revealed the planet-wide transformation occurring on Mars, as a dust storm continues to ravage the surface of the entire planet. The stunning images comes courtesy of the Mars Color Imager instrument strapped to the Mars Reconnaissance Orbiter, which maps the entire planet each day. Dust storms that circle the entire planet appear on Mars every six to eight Earth years, which equates to three to four years on the red planet. Astronomers still don't understand why or how these storms form and evolve. They hope to learn more about the phenomenon by studying the current conditions. Amateur skygazers back here on Earth are able to witness the effect the storm is having on the red planet, armed with relatively inexpensive hobbyist telescopes. Speaking to MailOnline, Dr Robert Massey, deputy executive director of the Royal Astronomical Society, said: 'The storm is visible from Earth, in that they grow quickly, often envelop much of the planet and block out surface detail. 'You might still see the highest volcanoes, like Olympus Mons, poking through it as well as the polar ice caps, but the usual dark features on the surface can be completely invisible. 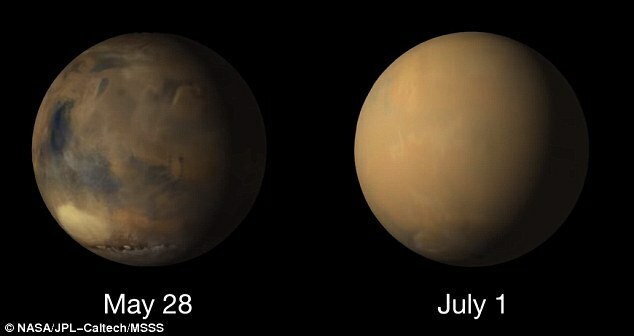 'With a decent telescope, observers can see the polar caps growing and shrinking in the dust storms. 'Right now is a good time to look at Mars as it's near opposition, the point when the planet is opposite the Sun in the sky and near its minimum distance from the Earth. 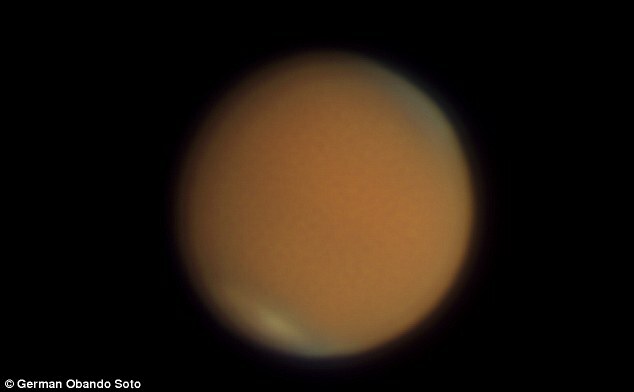 Dr Michelle Collins from the University of Surrey added: 'Amateur telescopes are able to image the Martian atmosphere, and some keen observers have already taken some wonderful photos of this global dust storm. 'For example, one image taken from Costa Rica with an eight-inch Meade telescope. 'The storm now obscures much of the surface of Mars, leaving observers with a more uniform red planet than they would have seen before. Scientists from Nasa first observed a smaller-scale dust storm on May 30, but by June 20, the storm had gone global. For the Opportunity rover on the surface of the planet, that meant a sudden drop in visibility from a clear, sunny day to that of an overcast one. Because Opportunity runs on solar energy, scientists had to suspend science activities to preserve its batteries. As of July 18, no response has been received from the vehicle. Luckily, all that dust acts as an atmospheric insulator, keeping nighttime temperatures from dropping below what Opportunity can handle. 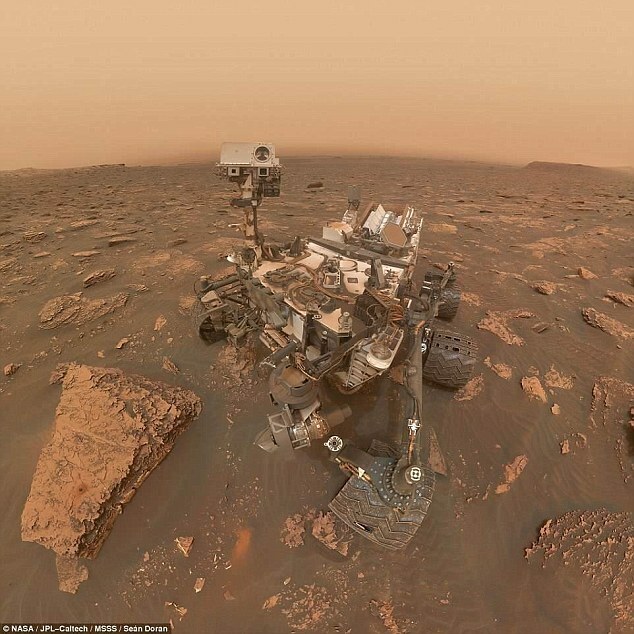 However, the nearly 15-year-old rover isn't anywhere near out of the woods yet, as it could take weeks – or even months – for the dust to start settling. Based on the longevity of a 2001 global storm, Nasa estimates it may be September before the haze has cleared enough for Opportunity to power up and call home. 'This is one of the largest weather events that we've seen on Mars,' since spacecraft observations began in the 1960s, said Michael Smith, a scientist at Nasa's Goddard Spaceflight Center in Greenbelt, Maryland. When the skies begin to clear, Opportunity's solar panels may be covered by a fine film of dust. That could delay a recovery of the rover as it gathers energy to recharge its batteries. A gust of wind would help, but isn't a requirement for a full recovery. The Mars Reconnaissance Orbiter, Mars Odyssey, and Mars Atmosphere and Volatile Evolution (MAVEN) orbiters are all tailoring their observations of the Red Planet to study this global storm and learn more about Mars' weather patterns. Meanwhile, the Curiosity rover is studying the dust storm from the Martian surface. With the Thermal Emission Imaging System (Themis) instrument, scientists can track Mars's surface temperature, atmospheric temperature, and the amount of dust in the atmosphere. This allows them to watch the dust storm grow, evolve, and dissipate over time. Since the dust storm began, the Themis team has increased the frequency of global atmospheric observations from every 10 days to twice per week.